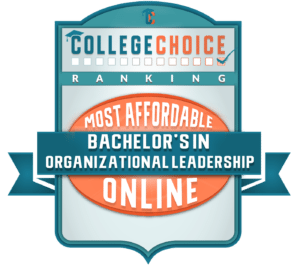 Graduates of this Bachelor of Science in Business – Organizational Leadership online degree program position themselves for leadership roles. Professionals with a bachelor's degree can earn on average well over $1 million more than high school graduates during their working lives. Start discovering your potential to be a truly capable leader in the business world. In addition to helping you acquire a large range of relevant business expertise, this program can teach you skills related to psychology and human interaction. Among many other things, you'll learn about managing people and operations, solving problems, recognizing opportunities, developing strategies, and conducting yourself as an ethical and socially responsible professional. 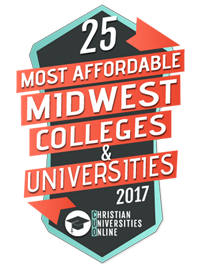 Ranked #22 Most Affordable Online Organizational Leadership Degree in the nation by CollegeChoice. This is a sample list of courses you will be required to complete for the online Organizational Leadership program. To view a full list, please click below to get your program guide. The course is built around the topics of planning, organizing, directing, controlling and decision-making. 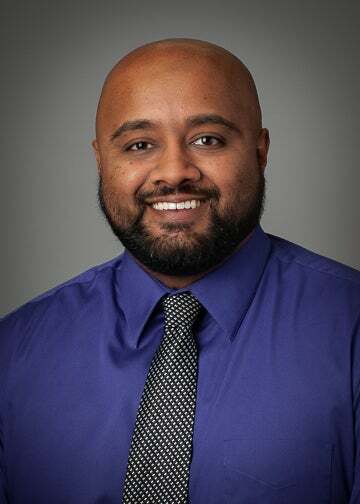 Get in touch with Rocky Desai to find out more about the Online Bachelor's in Business Administration program. What excites you most about working with students as an Enrollment Advisor? There is nothing that excites me more than helping students achieve their goals and dreams! In this module, several theories will be explored that attempt to explain what leadership is and how to apply it to key areas, such as influencing individual behavior, group or team performance, and change. Course examines the sources of power, motivational theory, and conflict resolution strategies. If you are looking to become a leader, secure lucrative employment and enjoy a fulfilling career, consider earning a bachelor of science in Organizational Leadership. Earning an online organizational leadership degree can put you on the fast-track to a rewarding position in human resources, change management, business administration and beyond. Your online bachelor of science in Organizational Leadership will arm you with the business acumen and interpersonal skills necessary to meet the rigors of the modern marketplace. If you are dissatisfied with your current position or looking for an employment opportunity that will allow you to become a leader, our online organizational leadership degree is the answer. The program's graduates obtain employment in a variety of roles as managers, supervisors and other leadership positions in the private sphere as well as the public sector. These professionals work in fields like Organization Management, Business Analysis, Training and Development and Human Resources. Your online bachelor’s in organizational leadership will provide you with the skills employers need today and far into the future. If you’re looking for an online bachelor’s degree that positions you as a leader and a change agent, consider Central Christian College’s bachelor of science in organizational leadership. You’ll gain the skills you need to establish yourself as a dynamic force in your company’s culture. Problem analysis and evaluation techniques are presented. Adult learners are shown methods for defining, researching, analyzing, and evaluating a problem in their work or vocational environments that they have selected for independent study project. Specific statistical information covered in the course includes identifying and measuring objectives, collecting data, working with significance levels, and analyzing variance and constructing questionnaires. "You know, I’ll be the first of my mom’s six children to have completed [a] college degree? Being an online student really helped me with balancing my work life and personal life. I also felt that the staff at Central Christian College gave me the support that I needed. I learned many strategies at Central Christian College. It landed me the job I have today, accounting at a non-for-profit in Chicago, IL with disabled children." 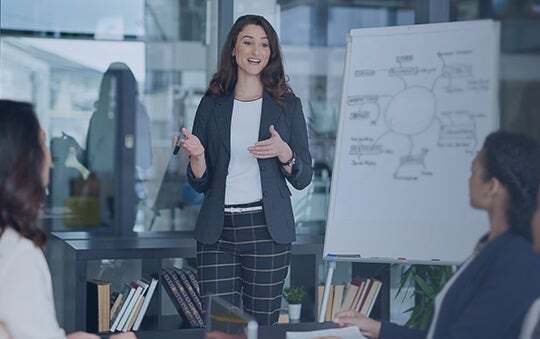 Obtaining a career as a business professional after completing a higher education in organizational leadership online provides an opportunity to focus on improving the effectiveness of the company. Organizational effectiveness relates to the efficiency of a business; however, a professional must also focus on quality services. The key to organizational effectiveness is using the right tools and strategies to accomplish a specific goal.